Parolin once again represented a large proportion of the 60 Mini field. The results included nine victories in the heats, 10 drivers in the top 13 of the Final and eight Parolins in the top 10 of the Championship. The numbers are always impressive. Because of the importance of slipstreaming on the long Neapolitan circuit, Qualifying Practices were not always easy to manage for the very young drivers in 60 Mini. Keanu Al Azhari and Giovanni Trentin, however, managed to achieve the 2nd and 3rd fastest times among the 87 participants, while Rashid Al Dhaheri was 15th. The latter however completed exemplary runs and returned to the front of the competition on Saturday night. Starting from 6th in the Final, Al Dhaheri took the lead from the second lap and brilliantly controlled his opponents until the finish. He took the lead in the standings of the series and earned a well-deserved crown. Also very fast, Giovanni Trentin achieved his best result by entering the top 10 in the Final. Victim of a racing incident at the start of his Prefinal, Al Azhari unfortunately could not defend his chances in the Final. It was also a Prefinal accident that delayed Gabriele Mini’s progress in OK. However, he managed to qualify 30th in the Final and a festival of overtaking allowed him to return to 8th position at the finish line. 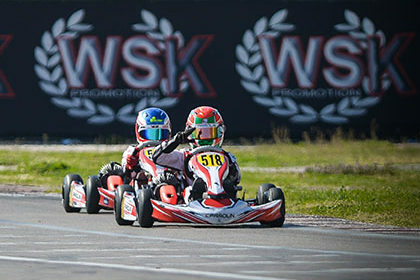 This remarkable effort allowed him to save his place in the top five overall of the WSK Super Master Series. Although he had to overcome his 30th place in the OK-Junior Timed Practice, Brando Badoer did a great job moving up to 7th in the Final before finishing 11th. Martinius Stenshorne fell to the back of the pack during a clash on the second lap of the Final, which prevented him from enjoying his potential as much as he deserved. 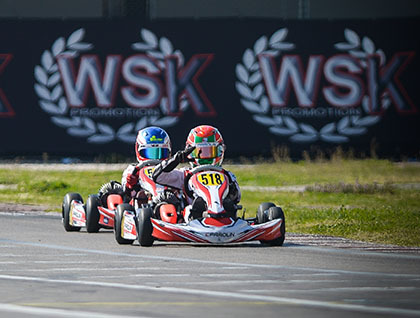 After an exceptional start to the season, Parolin is preparing to start the WSK Euro Series next weekend which will take place on the same circuit of Sarno. The goal is clear: to work even harder with the young drivers of the team to improve the results they are able to achieve with the high-performance equipment from Parolin.